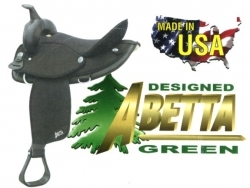 Abetta is owned by Action Company. Founded in 1968 in Grand Prairie, TX by Don Motsenbocker, his parents, M.J. and Fannie, and his brother-in-law, M.P. Willis and sister, Madge. Production started in a 4000 sq. ft. building with a pad and steel cable goods line. The name Action was chosen by the founders to evoke a liveliness and boldness to meet the dealer's expectations. And meet them they did. By April 1969, Action moved to an abandoned 30,000 sq. ft. cotton mill in McKinney, TX and added saddles and leather goods to their manufacturing lines. The company's formula-name, service and product - effectively combined the only logical next step - growth.